The Rosh Hashanah Seder, one of the oldest the holiday’s food traditions, is now one of its newest trends in celebrating the Jewish New Year. Eating symbolic foods the first night of Rosh Hashanah dates back to Rabbi Abaye’s instructions in the Talmud to eat five foods that were typical of the season. These foods had names or qualities that represent wishes for health, prosperity and a “good” year. Some sources say what we would now call a Rosh Hashanah Seder, or “order of service” has existed for about 2,000 years. Sephardic and Mizrachi Jews have a long history of serving and blessing not just the Talmud’s suggestions but a host of foods whose name or appearance supports the observance of Rosh Hashanah. Jews outside these traditions have adopted the custom of a Rosh Hashanah Seder by adapting some of the long-standing practices and adding new ones ranging from blowing of the shofar to reflecting on goals for the coming year to celebrating the New Year as the world’s birthday. 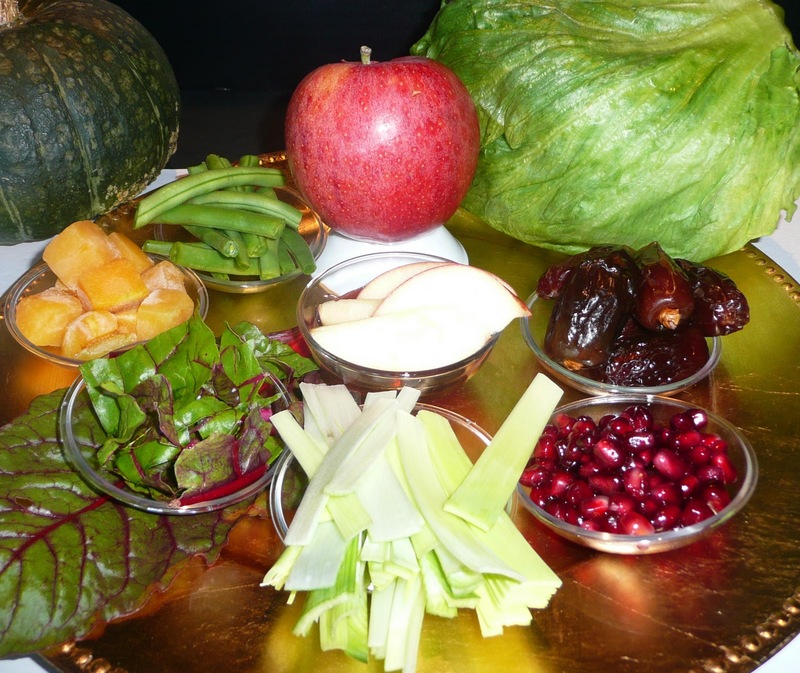 Below is information on the symbolism of certain foods and how to create your own Rosh Hashanah Seder and links for more information. (JIMENA) grew up participating in Rosh Hashanah Seders and recalls them fondly. She recommends families looking to start their own Seder tradition take a look at the book “Apples and Pomegranates: A Family Seder for Rosh Hashanah” by Rahel Musleah (Kar-Ben Publishing). The JIMENA Seder last weekend featured a vegetarian potluck, the group will be blessing apples for sweetness, dates for peace, green beans for prosperity, pomegranate for mitzvoth, pumpkin for happiness, beet leaves for freedom, leeks for friendship and a head of lettuce for leadership. A traditional Seder Yehi Ratzon (or Seder of God’s will) offers prayers that it will be God’s will that the participants be blessed in the coming year. There are many regional differences between the different cultures Seders. Some foods are avoided in one area, but sought out in another. Regional food availability and culture play a large role. One element that has been incorporated from European Jews is dipping apples in honey. Dates – The Hebrew word for dates (tamar) is reminiscent of the word for end and the blessing is that enmity will end. It is one of the Talmudic suggestions. Pomegranates – The pomegranate is thought to have as many seeds as there are mitzvoth and the blessing is that we may be as full of mitzvoth as the pomegranate is full of seeds. It’s plentitude of seeds are also associated with fertility and plenty. Green Beans – The Talmud instructs us to eat rubiya. Rubiya is actually fenugreek, a relative of the pea that features a small pod filled with seeds. The word rubiya is similar to the word for increase or multiply. In some cultures green beans became the stand in for fenugreek, in others (possibility because of its similar name – lubiya), black eyed peas became symbolic that it be God’s will that our merits increase. Pumpkin or Squash – another recommendation from the Talmud since the word for pumpkin or gourd is kraa, which is similar to the word to be called out and the blessing is that our good deeds should be called out. It is also similar to the word for to tear up, a plea to God to tear up any harsh judgments against us. Beet Greens or Chard – Silka, the Hebrew word for these greens, is similar to the phrase “that they will be removed” and the Talmud asks us to eat them as a way of asking for our enemies be taken away. Leeks or Scallions – Another food mentioned by Rabbi Abaye, the Hebrew word karti is similar to the word for cut off and the blessing is that our enemies be cut off. Fish or sheep head – This is said to symbolize the hope that the family members be the head and not the tail. Lamb is also symbolic of the story of Isaac’s binding and almost sacrifice, while fish are a symbol of fruitfulness. Today, many families substitute a whole fish with its head or a head of lettuce or a roasted onion or garlic bulb. Each food is passed around, blessed with “May it be your will God” (Yehi Ratzon) and sampled if appropriate. Many Sephardic and Mizrachi families also include those ingredients in the food they prepare for the meal. Benyamin Uriah Banuelos, whose family is a mix of Jews from Greece and Spain, is a member of San Francisco’s Magain David Sephardim Congregation. He said his family’s meal would always include leek patties, whitefish salad and pumpkin turnovers, all representative of the Seder foods. It also offers more contemporary blessings such as celery and raisins for prosperity (a raise in salary) and peaches for a “peachy” year as well as “Happy Birthday to the World” cupcakes for children to decorate. The Seder also includes “some time for families to talk about the coming year” as well as individual goals of “what you could do better,” she said. Schwartz said that in previous years participants start out saying “I didn’t know you were supposed to have a Rosh Hashanah Seder, but “they leave feeling good about the opportunity to have the discussions” and learning more about the traditions. A version of the above first appeared in the j. weekly. For Rosh Hashanah recipes, click here. Check out my Jewish category for more recipes and ideas. Update: 9/14/12 -- My 2012 Rosh Hashanah round up is here.